Getting tested – in more senses than one. Fifty years ago, in the dog days of August 1964, I was a midterm fetus in some amount of danger. The German measles, or rubella, was sweeping across the United States. It first struck the East Coast in the preceding winter and then quickly spread to the rest of the country. In April 1964, the Communicable Disease Center, the federal agency now known as the CDC, confirmed that a full-blown epidemic was in progress. For most people, the epidemic was fairly harmless. Rubella typically consisted only of a rash and fever and perhaps a few days in bed. Thereafter, one had immunity. For unborn children, however, the impact of the disease was much more severe. In 1941, Australian ophthalmologist Norman Gregg, acting on a clue offered by a concerned mother, discovered a connection between rubella in pregnant women and congenital cataracts in their newborns. Soon other harmful effects on the fetus were confirmed, including deafness, blindness, heart deformities, and mental retardation. Miscarriage, stillbirth, and infant death were also found to be real possibilities. Meanwhile, another Virginia, Virginia Joseph, my mother, worried about her pregnancy. A family on our block had had a case of rubella and she feared she had been exposed. All ended well: I was born healthy on December 1. I was given the middle name of Mario in honor of the Virgin Mary, whose intercession my mother had sought. In childhood I heard the story of my mother’s “difficult” pregnancy, but it was only a few years ago that my reading about the rubella epidemic, followed by a discussion with my father, led me to discover just where the difficulty lay. 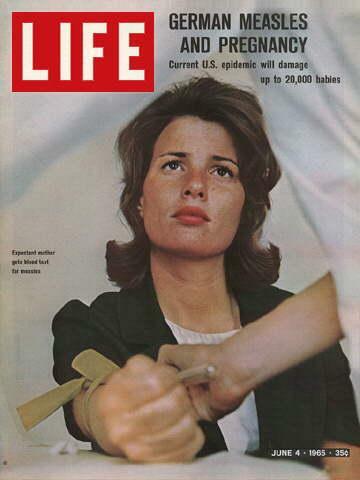 The rubella epidemic finally subsided in 1965. By then some 20,000 affected children had been born with severe birth defects and some 11,000 miscarriages and elective abortions had resulted. It is very probable that many of the elective abortions killed perfectly normal and healthy babies. In 1965, Life magazine, just weeks after publishing Linnart Nilsen’s now historic series of photographs of the fetus, presented a sympathetic cover story on women who chose to abort rather than carry their infected unborn to term. Until the 1960s, abortion was often portrayed in the media as a sleazy and dangerous practice. Along with the thalidomide scare of a few years before, the rubella epidemic helped make recourse to abortion seem more respectable. Like me, thousands of American children born in 1963-1965 escaped all harm from rubella. But the epidemic became a kind of scaffolding used to erect the edifice of legalized abortion. The rubella vaccine was developed in 1969 and unborn children are now safe from rubella. But the impact of the epidemic persists. The scaffolding is gone but the structure remains. Beautifully written! The rubella epidemic and its tragic legacy have been given one line in the modern U.S. history textbooks. Thank you for bringing this history, so to speak, to life! “…unborn children are now safe from rubella.” Ironically, this would be because more than 70 unborn children were prematurely taken from their mothers’ womb, immediately dissected and their organs harvested – while alive (dead cells are of no value). Why? To create human diploid cells, a medium for growing some vaccine cultures, like rubella (the first) and now more. Any of us that have had a these vaccines carry their fragmented DNA remnants. Your point is spot on when you say, “…the epidemic became a kind of scaffolding used to erect the edifice of legalized abortion.” Even more because the scaffold had the dual function of erecting another edifice, harvested fetal cells as a commodity. The Catholic community is dialoging on the ethical dilemma of fetal cell lines in vaccines, unlike the evangelical community which, as far as I can tell, prefers not to see, hear or speak of it.